Ride In Honor, an annual event hosted by Staab, is one in which truly honors our Nation’s Heroes, both past and present. 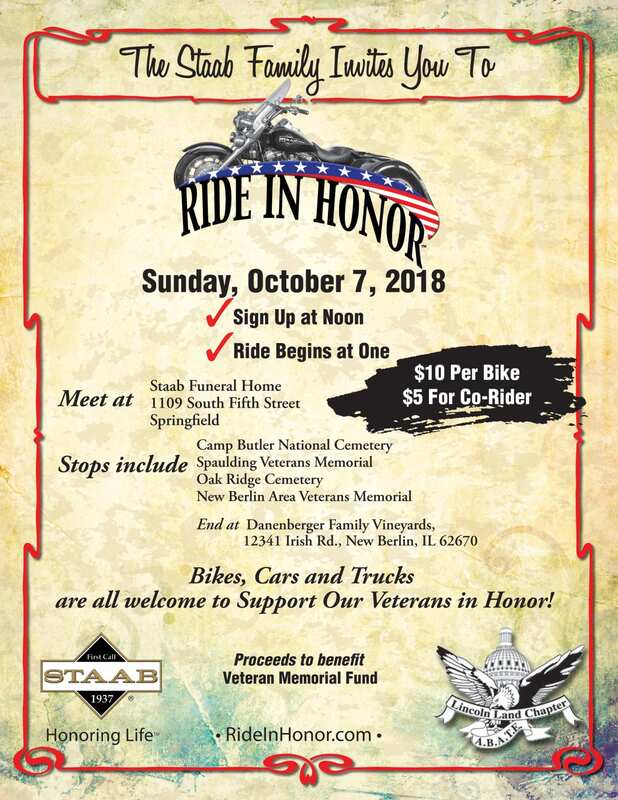 This “Ride” shows honor by stopping by several of our local Veteran’s memorials: Camp Butler National Cemetery, Spaulding Veterans Memorial, Oak Ridge Cemetery, and New Berlin Area Veterans Memorial. At each stop, a ceremonial wreath is laid to show appreciation, love and respect to the duty that each Veteran displayed by defending our Great Nation and what it stands for. After the last memorial, we will have one final stop (please see attached flyer, as it changes year to year) for continued fellowship and appetizers. You do not need to be a Veteran to be in this ride, its about everybody attending to show our love and support for our Veterans. Not only are bikes welcome for this ride, but cars and trucks as well. Let’s make some noise for our Freedom!